After the successful release of Despicable Me 2's Minion themed Happy Meal toys, McDonald's is following it up with The Smurfs 2 theme of toys. 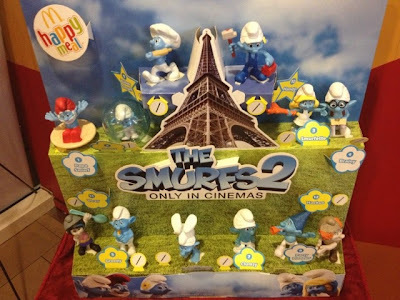 2 years ago, McDonald's featured The Smurfs Happy Meal that featured 8 characters from the first Smurfs movie. This time you can collect the 12 character from the movie sequel including Vexy, Jokey, Party Planner and Hackus. The Smurfs 2 Happy Meal is now available at your favorite McDonald's stores nationwide with one toy for every Happy Meal. You can also order the meal thru McDonald's delivery hotline 8MCDO (8-6236). I was able to take photo from my phone of the new theme of Happy Meal toys last night. If you like to collect all 12 toys, hurry now since The Smurfs 2 set of toys will only be available from July 24 - August 6, 2013.